Another project that used MSNose was to work out how much cheese there is in the ideal cheese sandwich. This project produced a real scientific surprise – there is no gain to be had by adding more cheese above a certain thickness, because this does not produce any more release of flavour. I am still trying to work out why! Aim: The aims of these experiments were to measure the concentration of “cheesy” aromas released when a cheese sandwich is chewed and swallowed, to find out if there is a way to maximise the release of these aromas, and to examine the effects of added foods (such as tomato or chutney) and temperature on the release of the aromas. *Many different aroma molecules contribute to the overall perception of flavour. The concentrations of most of these molecules are too low for accurate measurement, which is why the present experiments concentrated on the principal components. 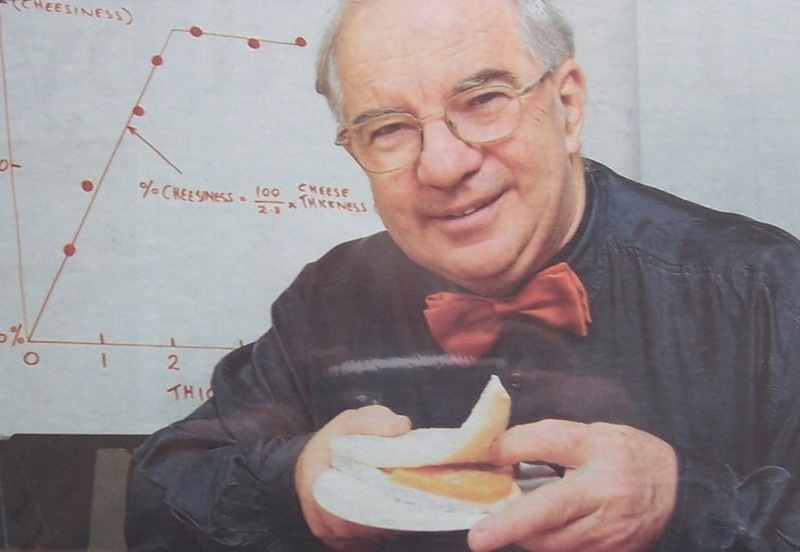 The experimental protocol was to make bite-sized sandwiches, 30mm x 30mm, using pre-sliced white bread which had been lightly buttered with margarine, and with different uniform thicknesses of cheese. In practice the amount of cheese in each sandwich was weighed, and the thickness calculated from the weight. Eight British cheeses were studied: West Somerset Cheddar, Caerphilly, Wensleydale, Cheshire, Blue Stilton, Red Leicester, Double Gloucester and Somerset Brie. For some experiments with West Country Cheddar, tomato, cucumber, apple or Branston pickle was added to the sandwich. The amount of butter or margarine was also varied in one set of experiments to test the effect of the change. Summary of Findings: The main finding was that concentration of “cheesy” aroma reaching the back of the nose initially increased in proportion to the amount of cheese in the sandwich, but reached a definite limit which depended on the type of cheese. This was quite unexpected; for other foods that have been studied by the MSNose technique (chocolate, crisps, chewing gum, mints), the concentration of aroma released increases in proportion to the amount of food in the mouth apparently without limit. For cheese sandwiches, then, there is an optimum thickness of cheese whose value depends on the type of cheese (see Table below). Somerset Brie may be an exception to this rule – unfortunately, the concentration of the aroma chosen as a marker was too low in sandwiches made from this cheese for reliable results to be obtained. A similar equation applies to the other cheeses, with the figure of 2.8 replaced by the optimum thickness for the particular cheese. Light buttering (with margarine or butter) of a cheese sandwich enhances the aroma release above the use of dry bread, or even eating the same amount of cheese without the bread. This is probably because the butter or margarine coats the tongue and holds the flavour in the mouth. Heavier buttering makes no further difference to the aroma concentration. Tomato shares with cheese the flavour component 2-methyl propanal (the aroma used as a marker in the experiments). When tomato is added to a cheese sandwich, the effect is additive for this aroma component i.e. tomato directly enhances the “cheesiness” in an additive way. Branston pickle also shares with cheese the flavour component 2-methyl propanal, but here the effect was not additive, and the addition of Branston pickle to a cheese sandwich did not enhance the concentration of 2-methyl propanal. It seems probable, then, that Branston pickle has other virtues (such as the introduction of acidity, or “sourness”, that make it a desirable additive for cheese sandwiches. Apple and cucumber had no shared component, and no perceptible effect on the concentration of 2-methyl propanal released from the cheese. Surprisingly, the temperature of the cheese (whether from the refrigerator at 50C or at room temperature of 220C) had no measurable effect on the release of 2-methyl propanal or any other of a number of low molecular weight esters examined. It is probable that the effect of allowing a cheese to come to room temperature is to make available the higher molecular weight aroma components which contribute to the complexity of the flavour, but whose vapour pressures are so low at refrigerator temperatures that they would not be picked up by the nose.